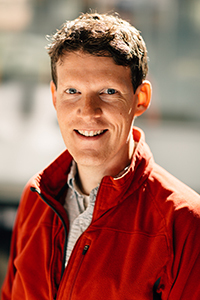 Adam Christensen’s interest in optimization sprung out of his interest in the policy making process and the analysis of those policies. His deeper motivation is to help policymakers, who may be interested in aspects of environmental sustainability, untangle a number of complicated decisions/tradeoffs inherent in interdependent systems. His current work has him developing large mixed integer programs (MIPs) to describe agricultural systems (i.e., concentrated animal feeding operations); these models can be used to understand the economic impacts of new environmental constraints that are designed to protect water sources. Previously, as an NSF SEES Fellow at Johns Hopkins University, he developed models of liquid fuel markets (gasoline, diesel, biofuels, etc…) to assess the impacts of policy changes with the Renewable Fuel Standard/California’s Low Carbon Fuel Standard. Before entering into the field of optimization Adam was the 2010-12 American Society of Mechanical Engineers (ASME) / American Association for the Advancement of Science (AAAS) Congressional Science Fellow where he worked as a policy advisor in the U.S. House of Representatives and the U.S. Senate.